Walter Ray Stamper Jr. known as Billy to many, lived in Scioto County all his life in the South Webster area. He is survived by parents Walter and Janice, one sister Melissa, daughter Bailey, wife Stacy, Nephew Aidan and brother inlaw Barry Snyder We all love and miss him so very much. He gratuated South Webster High School and Scioto County Vocational School in 1993. He enjoyed life to the fullest till he lost his battle to cancer. The Lord Giveth. The Lord taketh away. Blessed be the name of the Lord. On April 2, 1974, the Lord blessed the home of Walter Ray and Janice (Hay) Stamper, with a beautiful baby boy, whom they named Walter Ray Stamper,Jr., but was called by his family and friends, Billy. 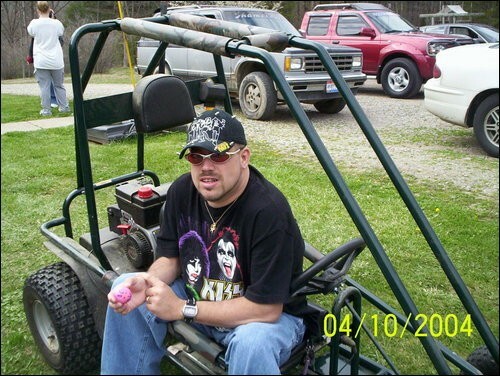 Billy lived in South Webster, Ohio and graduated from the Scioto County Joint Vocational School and South Webster High School in 1993. On December 23, 2006, the Lord graciously took Billy to his Heavenly home. Billy was preceded in death by his maternal grandfather, Denny Hay ,paternal grandparents, Robert B. and Eliza Stamper, and maternal great-grandparents, Ballard and Luverna Hay. Surviving are his special companion of 10 years, Stacy Kaulitz and daughter, Bailey, of South Webster, his parents, Walter Ray and Janice Hay Stamper of Wheelersburg, a sister and her husband, Melissa and Michael Barry Snyder and his nephew, Aidan Snyder, all of Wheelersburg,his maternal grandmother, Wanda Carr of Wellington, and many aunts, uncles, and cousins. A funeral service will be 1:00 p.m. on Thursday at the Brant Funeral Home in Sciotoville with Pastor Delbert Jordan and Pastor Blaine Etterling officiating. Interment will be in Vernon Cemetery. Friends may call at Brants in Sciotoville from 5-8 p.m. on Wednesday. Contributions may be made to the Hemophilia Foundation and the American Cancer Society. and wonder why you had to die. I would bring you right back to me. If tears could build a stairway and memories a lane, I d walk right up to heaven and bring you home again. No farewell words was spoken, no time to say goodbye, you were gone before we knew it and only God knows why. Our hearts still ach in sadness and secret tears still flow, what it meant to lose someone like you no one will ever know. Since you will never be forgotten, we pledge to you today, a hallowed place within our hearts is where you ll always stay.